According to my viewers, my Toronto category has been lacking a bit. So this post is for my fellow Torontonians. Think steak with fries, red wine and dessert. Not bad, right? To me, this sounds like Jacobs & Co Steakhouse, located in the heart of Toronto at 12 Brant Street. The menu above is what I crave pretty much once a month. 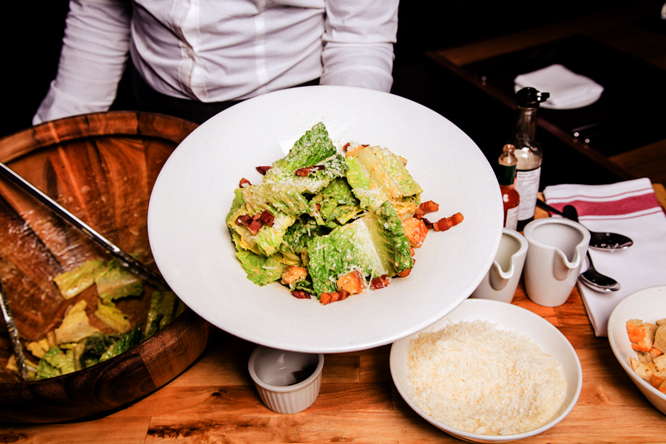 These guys know their steaks and wines never mind the Caesar salad, which can easily turn into anyone’s favourite. Their wine menu is quite intimidating; however I will forever remain loyal to Copain. The steaks range from different regions depending on your budget. The sides are seasonal but I can always count on my foie gras duck fat fries. Cheeses are yet another layer to be discovered in this restaurant, but, of course, they have others, like vanilla crème brule with pistachio biscotti and cardamom shortbread, or warm apple crumble – the sky is the limit in this establishment. The first time I dined at the restaurant I was taken aback by the excellent service and our waiter. What is always a topic of discussion every time I have gone back since are the conversations and people around me at adjacent tables. Fine-dining people watching has never really appealed to me until Jacobs. But here you hear things like, “I think Woody Allen is great! I had dinner with him the other day…” or “I closed a huge deal. I mean, of course, I did – do they know who I am?” and then there was the odd table where no one spoke a word for an entire dinner. Jacobs is one of those places for special occasions… oh how I miss my steak!